Wet n Wild's Sunny Side Up that made me feel like Sailor Venus! I hope you liked the look. 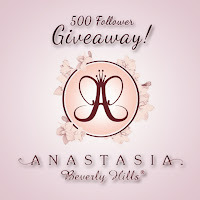 Have an awesome weekend and make sure to enter my 500 follower Giveaway! Wow, incredible look. Makes me think of cream orange popsicles and.... yummy whipped cream! The lips look amazing<3 Great job, like always! I love all the orange! It's gorgeous. What an amazingly stead hand you have to create such a nice, even cut crease. Very jealous.